At his flashiest restaurant since Sona, chef David Myers (also of Comme ça)—along with executive chef Kuniko Yagi—rebrands Asian fusion. 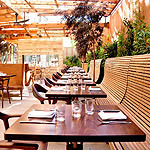 The menu targets a variety of diners (a must in Century City) with “simply grilled” items as well as more experimental “inspiration” dishes. There’s something of the moment about preparations like the black cod beneath a sliver of still-smoldering Hinoki wood and the Southeast Asian-style pork served with lettuce wrappers and roasted chili sauce. Skate wing is brushed with spicy sambal and served on the bone, and the puffy bun of a brimming lobster roll is tinted black with charcoal powder. Cocktails are a priority. » 10 W. Century Dr., 310-552-1200 or hinokiandthebird.com.